Infomap GPS Machine Guidance is the Uk's foremost Prolec approved 3D GPS system Distributor and Service Agent. Infomap GPS Machine Guidance is unique in the fact that we can also conduct site surveys, and have the expertise to translate design plans into full “dig ready” Digital Terrain Models (DTM) – allowing you to dig to plan, 1st time every time. Working for major clients as Chartered Land Surveyors we draw on over 35 years experience. We have substantial knowledge of GPS systems and Digital Terrain Mapping; allowing us to tailor our services to suit the needs of you, the customer. GPS machine guidance is a system using GPS based technology to guide construction plant on site and through the digging process. 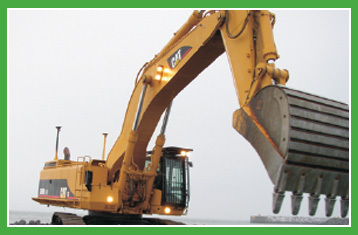 GPS sensors mounted on the plant accurately read the location, orientation and position of the equipment. Key information is then relayed to the machine guidance module and displayed in real time 3D to the plant operator through a cab mounted screen. By following the onscreen information the plant operator is then able to dig exactly to plan ensuring the job is done quickly, efficiently and with precision.